"Bhutan" 'the land of thunder Dragon' and 'the last Shangri La' on earth, is situated in the lap of Eastern Himalayas between India and the People's Republic of China. Covering an area of 18000 sq miles, the tiny Himalayan Kingdom of Bhutan is one of the most isoated nations in the world. Spectacular mountain terrain, varied flora and fauna and unique ancient Buddhist monasteries have made Bhutan an exemplar tourist destination, it is bestowed with rich bio-diversity harboring around 300 medicinal herbs and 165 endangered species. Each part of Bhutan has its own, historical, geographical, cultural, traditional and religious significance. It is Known to the natives as Druk Yul (The land of the Thunder Dragon). 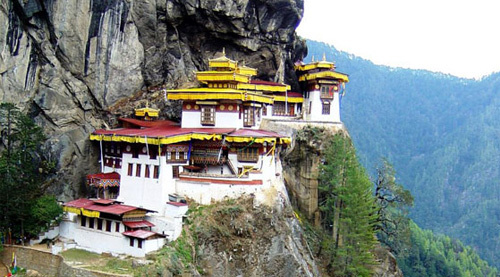 Bhutan is regarded as the last paradise on Earth. It is isolation, spectacular mountains varied flora and fauna, ancient Buddhist monasteries, vibrant culture and mystic aura have made it so. It is small in size. The kingdom's topography is one of the dramatic contrasts from the near-tropical southern border with India at an altitude of 300m,the land rises to culminate in the over 7000m peaks of the Himalaya in the North. Which from a natural frontier with Tibetan region of Bhutan's Northern neighbors China. The capital of Bhutan is Thimpu. There are many places to see in Bhutan, these are: Memorial Chorten (dedicated to the late king Jingme Dorji Wangchuk), Traditional medicine Hospital, Paro and other places like: Bumthang, Thongsa, Punakha etc. Access: Druk Air (The Bhutan's Airlines) operates flights to Paro from Bangkok, Kolkata, Dhaka, New Delhi and Kathmandu also. The overland entry point is in the Indian state of West Bengal into Phuntsholing in the south west Bhutan. Phuntsholing is four hour drive from Gangtok (sikkim) and Darjeeling. The drive from Phuntsholing to Thimpu takes six hours. Tariff: Tourism Authority of Bhutan (TAB) has set minimum tariff which are different for high and low seasons. Individuals and group of less then four persons must pay sur-charge. The rates are the same for both cultural tours and treks. Seasons: March to May and September to November are the high season months. While June /July and December- February comprise the low season. During summer maximum 30 degrees Celsius and in winter minimum 1.1 degrees celsius. Accommodation: Modern hotels are available in Thimpu, The outlying areas have comfortable resorts and lodge.